From the big screen to your car stereo, invasion of privacy through marketing is more alive than ever. 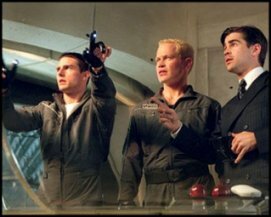 The science fiction film Minority Report took a scary look at how intrusive advertising can become in the future. In the film, scanners would read the retinas of people's eyes (which also double as identification passes) to determine exactly what kind of ad would be effective at exactly that moment in time. These 'interactive' ads are then projected on the wall with captions like 'yes, a Guinness would be great right now'. In another scene a virtual Gap employee stands outside of the door and greets Tom Cruise by name and asks him if he enjoyed the sweaters he bought his last visit. MSN is not that far off. All of your behaviour on the net is cross-referenced with the personal information you put about yourself when you signed up for an account with Hotmail. In this way, marketers know exactly what target market you belong to, and how to best sell to you by your previous shopping tendencies. Now Sacramento based Smart Sign Media has taken the invasion of privacy one step closer to Minority Report. As you drive down the highway, these 'intelligent' signs pick up on the radio station that you are listening to in your car and then select an ad that would be appropriate to the same target market. In other words, if you love classic oldies radio, you will be seeing a lot of signs for wrinkle cream and golf courses. The next step will be consumers receiving specific ad promo offers and coupons directly to their mobile phones. Scary, isn’t it?